Kona is the name given to coffee grown in the Kona Districts on the island of Hawaii. Only coffee grown in this area can legally be called Kona coffee, and the state of Hawaii has strict regulations in place to protect the authenticity of one of its most prized exports. The volcanic soil and frequent afternoon rainfall along with sunny mornings and cool nights are prime conditions for growing coffee. The rarity of the Kona bean and the limited size of the growing area help make Kona coffee some of the most expensive coffee in the world. Of course, the best place to purchase Kona coffee is on the island of Hawaii. 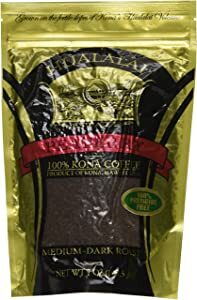 Unfortunately, that is not a reality for most of us, so I have created the following Kona coffee review to help you find the best Hawaiian coffee available from various online retailers. Caza means “hunt” in Spanish and symbolizes the company’s relentless pursuit of the perfect cup of coffee. 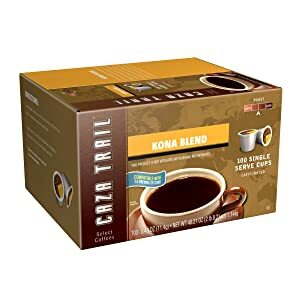 Caza Trail Kona Blend features a combination of beans sourced from Kona Maku on the island of Hawaii and Latin America. 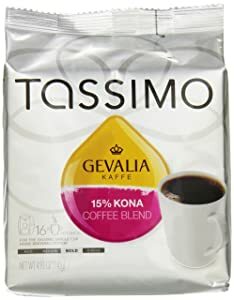 This medium-roast blend produces a coffee that is delicate and slightly acidic with a subtle aroma that will instantly transport you to the tropics. 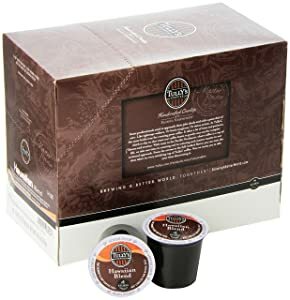 Caza Trail Coffee is certified as kosher, and the K-Cups are compatible with 1.0 and 2.0 single-serve brewers. Tully’s Coffee was founded in 1992 and is the last remaining independent Seattle-based coffee company. Tully’s specializes in small-batch roasting using gourmet beans. This medium-roast blend uses 10 percent Kona beans along with other Arabica beans to produce a coffee that is balanced and slightly sweet. Victor Allen Coffee started out in 1979 in Madison, Wisconsin, as a specialty micro-roaster. The company is now known as Trilliant Food, Beverage & Nutrition and offers a wide selection of coffees, teas, and specialty drinks. 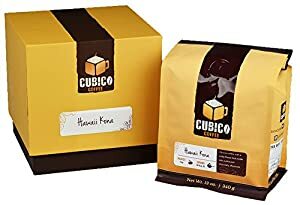 Their medium-roast Kona blend uses 100 percent Arabica beans for a mild coffee that is smooth with a slightly floral aroma. Victor Engwall founded Gevalia in 1853 when he started importing coffee in the small town of Gävle, Sweden. The company now offers more than 30 varieties of single-origin and coffee blends from around the world. The company’s Kona blend features 15 percent Kona beans for full-bodied coffee with sweet notes and hints of nuts. Senseo was one of the earliest single-serve coffee makers. The coffee maker and coffee pods are difficult to find in stores; however, they are still available through various online retailers. 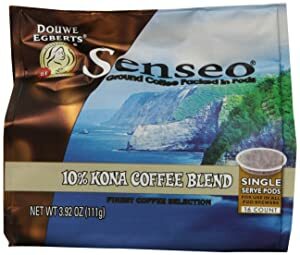 All Senseo coffees are selected and roasted by Dutch company Douwe Egberts. 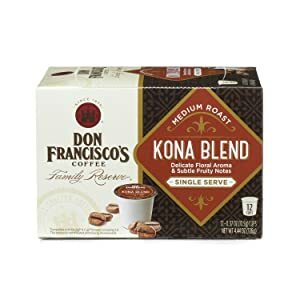 The company’s Kona blend uses 10 percent Kona beans along with other premium Arabica beans. The coffee has a bold aroma and smooth taste with hints of fruit and chocolate. 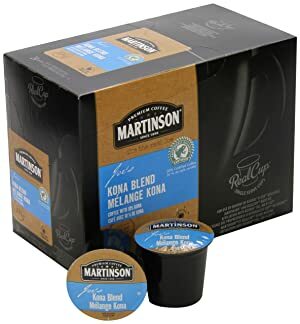 Many believe that referring to a cup of coffee as a “cup of joe” is a reference to Joe Martinson who started roasting coffee in New York City in the late 1800s. The company still roasts coffee today with the same dedication to freshness and flavor as its founder. The flavor is bold yet balanced with a touch of sweet island flavor. Cameron’s was founded in 1978 in Minnesota. 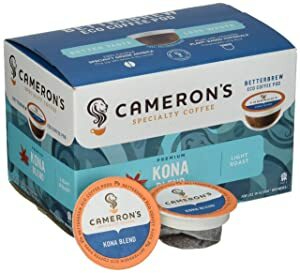 Each batch of Cameron’s coffee is handcrafted from premium beans. Their single-serve pods are compatible with K-Cup brewers but use a filter instead of a plastic cup, which makes them eco-friendly. 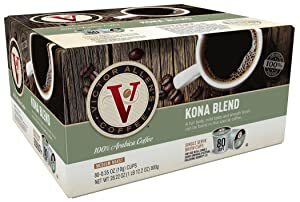 The company’s Kona blend is medium-bodied with a bright, sweet flavor that has undertones of nuts and chocolate. Don Francisco’s passion for roasting coffee turned into a family business in 1870. The family carries on his legacy today by sourcing and roasting coffee from some of the world’s premier coffee-growing regions. 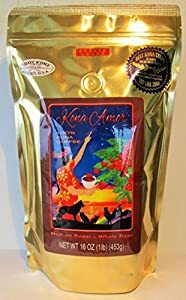 The company’s Kona blend combines the best Hawaiian coffee from the big island along with Mexican coffee grown at high altitudes to produce a rich flavor and floral aroma. Copper Moon is based in Lafayette, Indiana, and has been in the coffee business since 2007. 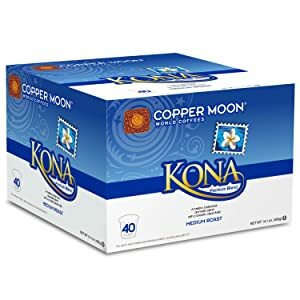 Copper Moon uses Kona and other 100 percent Arabica beans to create a coffee that is mellow and aromatic with a clean finish. It is important to note that all of the coffees in this category are Kona blends and not true Kona coffee. This is one reason why they are not as expensive as pure Kona coffee. A blend will never be as smooth as 100 percent Kona coffee. The blend from Gevalia uses the highest percentage of Kona beans, so you will get more of the traditional Kona flavor. This is true Kona coffee grown in the famous Kona coffee belt on the island of Hawaii. The volcanic soil and unique growing conditions of the area produce a coffee that has a lingering sweetness and complex notes of chocolate, vanilla, and almonds. 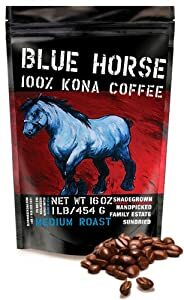 Blue Horse sources from a single estate and its beans are hand-picked and government inspected and certified. It is important to note that these beans are medium-roasted and do not have a dark, oily surface. Imagine sources from a single estate where the coffee is grown in the shade of Macadamia trees. The beans are hand-picked, sun-dried, and air-roasted to create a flavor that is sweet and robust yet smooth. 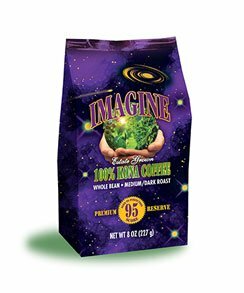 Imagine only uses beans that are graded Extra Fancy. 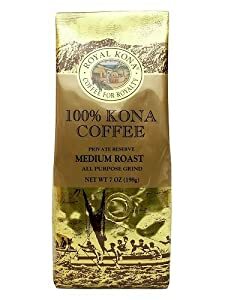 Royal Kona has been in the coffee business since 1968. The American Academy of Taste awarded Royal Kona’s Private Reserve 100 percent Kona coffee a rating of “superior.” The brew is full-bodied, smooth, and aromatic. Cubico is unique in that the company allows you to choose your beans, grind, and roast type to create a custom coffee. Their Kona coffee is citrusy and acidic with a flavor that is nutty and slightly grassy. You will also notice a chocolate aftertaste. Hawaii Roasters is a family-owned small-batch coffee company. Their coffee is hand-picked and sun-dried. The medium roast produces a mild and delicate coffee. Hawaii Roasters was even awarded the Hawaii Governor’s Export Award. 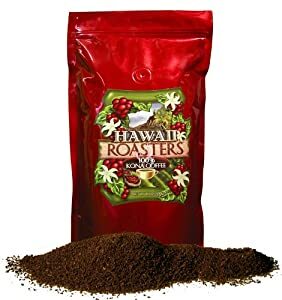 Hawaii Roaster uses the same select Kona coffee beans for its dark roast as its medium roast. The longer roasting process will give you a coffee with a stronger roasted flavor as opposed to the more subtle flavor of the medium roast. 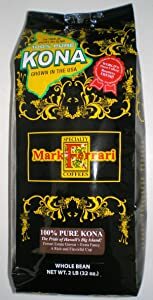 Mark Ferrari Specialty Coffees has nearly 30 years of experience roasting coffee. Their Kona coffee comes from the Big Island where the family has had a coffee farm since 1980. The quality of the beans and the roasting process produces a brew that is unmatched in flavor and aroma. Started by a school teacher who started roasting coffee as a hobby, Hualalai coffee is named after a mountain near where the coffee grows. What makes Hualalai Estate coffee different from other estate coffees is that it is sourced from multiple farms. This allows the company to select beans that are identical in size, which produces a more even roast and superior flavor. Fike Farms was founded in 1998 and transferred to new ownership in 2010. Since then, Fike Farms has won awards in cupping competitions and been named one of the best Kona coffees available. The flavor is slightly floral with hints of chocolate. You really cannot go wrong with any of the coffees in this category. Purchasing whole-bean coffee will ensure maximum freshness. Each of these coffees is 100 percent Kona and must pass strict state inspection and quality standards. 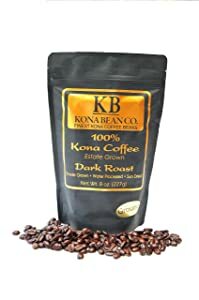 If you are going to spend the money for pure Kona coffee, I would recommend getting a medium roast instead of a dark roast so that the complex flavors of the coffee will not be masked by the roasting process. This is the same pure Kona coffee that the company offers as whole beans. The coffee is ground to an all-purpose grind. Mark Ferrari Specialty Coffees can pre-grind any of their coffees to an all-purpose grind. The company recommends using 3.5 ounces of coffee to 10 cups of water. 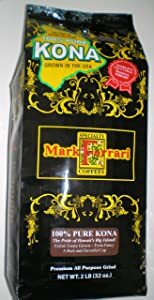 Kona Hawaiian Mountain Gold is a product of the Ferrari Coffee Company. The beans are cultivated on a 100-year-old coffee plantation and artisan-roasted to produce some of the finest Kona coffee in the world. You can get the company’s pre-ground 100 percent Kona coffee in medium or dark roast. 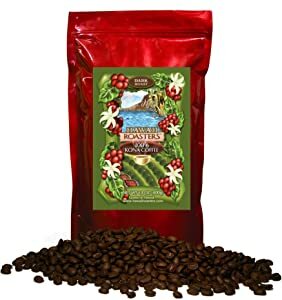 Hawaii Roasters offers its award-winning Kona coffee in an all-purpose grind for the same price as its whole beans. Kona Peaberry is a rare and exquisite coffee bean. Theses beans only account for approximately 4 percent of the total Kona crop. The flavor includes hints of lemon, chocolate, and cedar. Hawaiian Gold Kona’s Gourmet Blend comes from the 900-acre Parry estate located on the Big Island. In addition to the estate-grown Kona beans, the company’s Kona blend also uses other mountain-grown Arabica beans. The Kona Bean Company custom roasts its beans to ensure a consistently balanced cup of coffee. The brew is rich with flavor notes of berry, honey, and chocolate. The company offers pre-ground coffee in both a medium and dark roast. 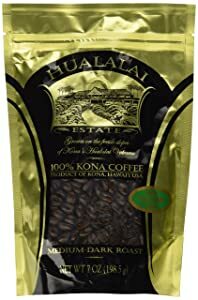 In addition to the whole-bean Kona coffee mentioned above, Royal Kona also offers its Private Reserve and Estate Kona coffees in pre-ground form. Aloha Island Coffee was founded in 2000 as a small family business. The company now offers a wide range of 100 percent Kona and Kona blend coffees. The company’s King’s Reserve coffee features Kona, Hawaiian, and Sumatran beans for a mellow coffee with no bitter aftertaste. 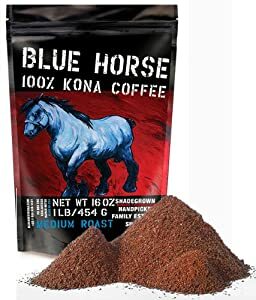 Although you do lose some flavor in the grinding process, each of the pre-ground 100 percent Kona coffees in this category still produce a quality cup of coffee.